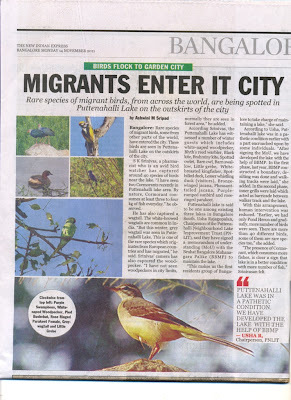 BANGALORE: Rare species of migrant birds, some from other parts of the world, have entered the city. These birds are seen in Puttenahalli Lake on the outskirts of the city.S K Srinivas, a pharmacist who is an avid bird watcher has captured around 40 species of birds near the lake. “I have seen two Cormorants recently in Puttenahalli lake area. By nature, Cormorant consumes at least three to four kg of fish everyday.” he observed. He has also captured a wagtail. The white-browed wagtails are common in India. “But this winter, grey wagtail was seen in Puttenahalli Lake. This is one of the rare species which originates from European countries and has migrated,” he said. Srinivas’ camera has also captured the woodpecker. “I have not seen woodpeckers in city limits, normally they are seen in forest area,” he added. According Srinivas, the Puttenahalli Lake has witnessed a number of winter guests which includes white-naped woodpecker, Blyth’s reed warbler, Black kite, Brahminy kite, Spotted owlet, Barn owl, Barn swallow, Little grebe, White-breasted kingfisher, Spot-billed duck, Lesser whistling duck (visitors), Bronze-winged jacana, Pheasant-tailed jacana, Purple-rumped sunbird and rose-ringed parakeet. Puttenahalli lake is said to be one among existing three lakes in Bangalore South. Usha Rajagopalan, Chairperson of the Puttenahalli Neighbourhood Lake Improvement Trust (PNLIT), said they have signed a memorandum of understanding (MoU) with the Bruhat Bangalore Mahanagara Palike (BBMP) to maintain the lake. “This makes us the first residents group of Bangalore to take charge of maintaining a lake,” she said. According to Usha, Puttenahalli lake was in a pathetic condition earlier with a part encroached upon by some individuals. “After signing the MoU, we have developed the lake with the help of BBMP. In the first phase, last year, BBMP constructed a boundary, de-silting was done and walking tracks were laid,” she added. In the second phase, inner grills were laid which acted as barricade between walker track and the lake. The presence of Cormorant, which consumes more fishes, is clear a sign that lake is in a better condition with more number of fish,” Srinivasan felt.